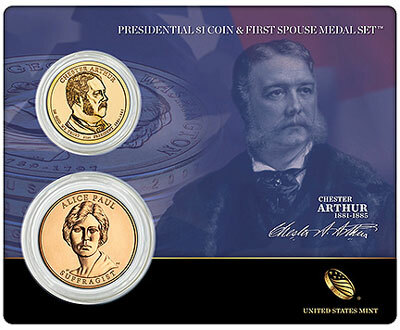 On October 18, 2012, the United States Mint began sales of the Chester Arthur Presidential $1 Coin & First Spouse Medal Sets. This represents the first release for this product type in nearly ten months. Production problems with some of the 2012 First Spouse Gold Coins delayed the first gold coin release until just last week. This also resulted in the delayed release of products including bronze medals, which feature the same designs as the gold coins. The Presidential $1 Coin and First Spouse Medal Set includes one uncirculated Chester Arthur Presidential Dollar and one Alice Paul Suffragist Bronze Medal. The two are mounted on a durable plastic card illustrated with a portrait of President Arthur on the front and issuance information on the back. I must say, Alice Paul was quite attractive! Chester was a lucky man to have such a strong, wonderful woman faithfully by his side. I think you might realize this, but Alice Paul was an infant while Chester Arthur was President. Her appearance on this product type called the “Presidential $1 Coin & First Spouse Medal Set” is the result of the authorizing legislation specifically calling for her to be recognized in First Spouse Gold Coin Program.